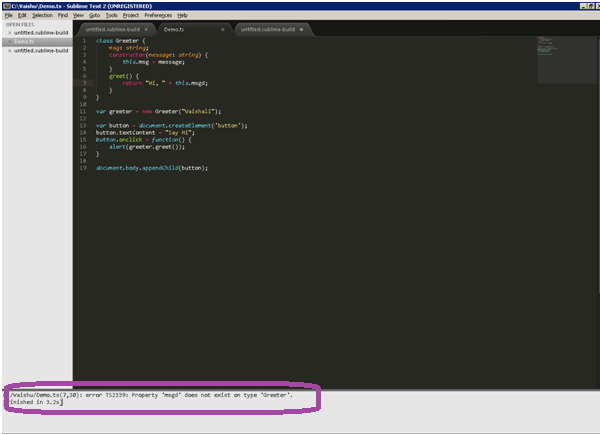 In this article we are going to focus on how to integrate the TypeScript with Sublime Text 2. Assuming that we have Sublime Text 2 already installed on our windows machine. Sublime Text". This will download the "typescript_support_for_sublime_text.zip" folder. Now unzip this folder. Step 2: Now copy the "typescript.tmLanguage" TMLanguage file and paste it in the "C:\Users\NameofUser\AppData\Roaming\Sublime Text 2\Packages\User" folder. In the above path Nameofuser is generally the user logged into the machine so replace it with your name as logged in. Step 3: Now open Sublime Text2 editor -> Go to Tools -> Build System -> New Build System and paste the below instructions in the opened file. Step 4: Now save this file in the same folder as above with the name "Typescript.sublime-build". Step 4: Now create a new file and paste the below code. Save the file as "Demo.ts". Here is the typescript extension. Step 5: Now press Ctrl + Shift + B to build the file. If the build is successful. It gives a Build Finished message. Now lets see what happens if there is some error in the above code. In the below code, Replace msg with msgd and Build the file. C:/DemoApp/Demo.ts(7,30): error TS2339: Property 'msgd' does not exist on type 'Greeter'.